every man, women, and child for hundreds of years. BERN is a PoW/PoS hybrid. This means that coins are generated through both Proof of Work mining and Proof of Stake minting. Both PoW and PoS are processing BERN transactions and validating transactions. You are rewarding for doing so. Thanks to ‘easy pool mining’, PoW mining has never been simpler! Just a click of a button and you are pool mining BERN with your CPU! GPU mining is much more efficient but, needs additional and more sophisticated software. A mining pool currently offering BERN PoW mining is JadePool. 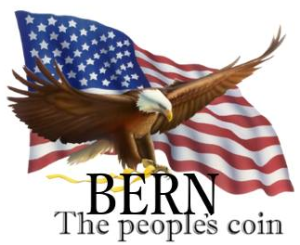 Proof of Stake happens after you have held BERN in your wallet longer than 24 hours. You are rewarded 10% annual with BERN. Think of it as earning interest on your BERN holdings. You must have your BERN wallet running, fully synced, and unlocked to stake.